Randy Webb, Royal AR, LS 6 Fiberglass: "Awesome job, very professional and on time"
Jessica Moore, Bryant, AR, 4 x 6 safe room: "Our installers ran into a problem during installation. They informed us of the problem & explained their solution. Very professional!" 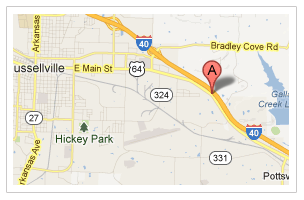 John Wright, Perryville, AR 4 x 6 safe room: "Installers very professional. Did a great job!!!" Garry Shelby, Mayflower, AR, 6 x 8 Slope: "Great Job - Customer Service like this is hard to find - tell everybody to call me. I am impressed and a satisfied customer." Robert Collins, Cabot Ar, 3 x 7 Garage Floor Shelter: "Your employees were very knowledgeable, and very helpful concerning the [garage floor shelter]. All I can add is your employees were the best, keep up the good work." Stephany Barnette LS 4, Austin, AR: "Angel was courteous & professional. Great product & good value for my money." Richard Rogers/Todd Hull, 5 x 6 safe room, Conway AR: "Installers were friendly, courteous, and professional at all times. They went over shelter & installation in detail and answered all questions. Excellent installation & product!" Corey Cooper, 3 x 7 garage floor shelter, Searcy, AR: "I am very pleased with the installation and storm shelter." Doug Scott, Hattieville, AR, 6 x 8 slope front: "If we had 10 homes you would be the supplier and installer. Great Job!!" Lee Harris Jr, Morrilton AR, 6 x 8 slope: "Installers were very courteous & prompt - did a very good job! " Salvation Army, Fort Smith AR, Garage floor shelter: "Your crew was very, very good and took care in everything they did. Very impressed!! Thank you"
Brian Turner, General Contractor, garage floor shelter: "Guys were on time & got straight to work. Very professional! I will recommend your company to my clients. PS. Gina was great to deal with over the phone during the scheduling & coordinating. Thanks Gina!" Cathy Barnes, Solgohachia, 6 x 8 slope: "Thanks!Overall good experience and all went as planned. Appreciate instructions for/and rebate application." Charles Cooper, Vilonia, LS 6 fiberglass: "Angel did a fantastic job. whole process with outstanding . Thanks"
Jared Smith, Paron, Garage floor shelter: "Angel and Jose were great. There were here on time, very professional and very clean while installing garage floor shelter. They didn't leave a speck of dust on the floor. Great team!!" Larry Acklin, Conway, 6 x 8 slope front with brown deco: "We were very pleased with working with your company. Angel did a wonderful job coordinating everything and explaining the installation process; even located someone to haul in extra dirt. He did an excellent job explaining the paperwork. Thank you Gina for all your help and keeping us informed. Thank you very much!! The Acklin's. " Bobby Bryant, Monette, 5 x 7 slope front shelter: "Always have a great experience!" Larry Colvin, Heber Springs, 6 x 8 slope front decorated top: "We couldn't be happier with our decision to purchase an in ground shelter from Arkansas Storm Shelters. We were treated with utmost courtesy and professionalism by everyone from Gina and the owner, as well as the guys who did the installation. We wouldn't hesitate to recommend your business to anyone. Thank you for a truly positive experience! " Charles Holderman, Ozark, 6 x 8 slope: "You installation team was very professional. I have recommended you to co-workers & friends. 5 stars!!!" Charles McCool, Danville, 3 x 6 bolt together safe: "Very impressed with the crew"
Darrel Allen, Hensley, 3 x 7 garage floor shelter: "Great Service, Angel and crew were very professional, courteous, very efficient. " Jessica Sanders, Searcy, 6 x 8 slope front: "You have an efficient systems - didn't take long to do install at all. Angel very helpful & informative as well as Gina"
Kathryn Davis, Vilonia 3 x 7 garage floor shelter: "Angel did a great job on our installation!The shelter was installed quickly and they cleaned up completely when done. Thanks!" Linda & Tom Luyet, Conway, LS 12 fiberglass: "We are very pleased with the installation & the shelter." Phillip Holderfield, Maumelle, LS 4: We are very satisfied customers "John Scroggins, Lonoke, 5 x 7 slope front: Great Job - very professional. Angel did a great job!!!" Ruby Hill, Alexander, AR, LS 4: "Angel - would rate a 10! Very Professional - great work!" James R. Jolley, Little Rock, LS6: "Very pleased, Angel (installer) was outstanding. " Greg Brown, Malvern, AR, 6 x 8 slope front shelter: "Outstanding job y everyone involved in this process. May you be receiving blessings from God." Aaron Boyette Hot Springs, 5 x 7 slope: "Thank you guys for our shelter! The service was prompt and appreciated, and Angel is awesome! He explained everything thoroughly and professionally. " Clifton Woods, Houston AR, Flat top concrete shelter: "Everyone involved was very nice. Every question I asked, they answered very well. From the time they got here until they went on their way they was very professional. The best of all there was no profanity spoke at any time." Gabriel Rodelo, Springfield, AR, flat top concrete: "They installed and cleaned up good. They made sure it where I wanted it and were very friendly."